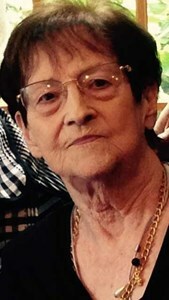 Dorothy Williams Capria, 87, passed peacefully on January 21 surrounded by the love of her children. She was born to Frank Williams & Evelyn Sewell-Law on May 10, 1931. She was raised on a beautiful farm in Panther Lake, NY. She was sister to Verna Faulkner (Stanley), Helen Cornell (Richard), Francis Moran (William), and her twin brother Donald Williams. She is survived by her loving “sister” in-law Joan Williams. Dorothy was also the beloved aunt to numerous nieces and nephews by relation and many others by choice. Dorothy left her five children with many happy memories and her deep abiding love - Stephen Capria, Julie Zahn (Dave), Robert Capria (Maria), Allynn Toney (Cris) and Suzanne Cunningham (Larry). She adored her nine grandchildren, spending many hours at their individual activities, hunting for treasures and sharing an ice cream. Her four great grandchildren were blessed to know her love and care, even throughout her last days. Formally married to Robert H. Capria, Dorothy continued to hold the Capria family in her heart as they held her. Due to her passion for children, Dorothy was a receptionist at University Pediatrics, retiring after 20 years. We would like to extend our deepest gratitude and appreciation to the angel care givers at PACE of CNY, Malta House/Malta Manor, for their unwavering compassion and dedication. A Celebration of Life will be held 2-9 pm on Friday, May 3rd at the North Syracuse Community Center, South Bay Road. Funeral services will be at Amboy Center United Methodist Church, Williamstown NY on Saturday May 4th at 11 am. To share a memory of Dorothy, or leave a special message for the family, please click the Share Memories button above. Add your memories to the guest book of Dorothy Capria. Dear Suzanne, Allynn, Bobby, Julie and Stephen - I am very sorry for your loss. I remember the first time I met your Mom and thought to myself “what a classy lady”. Through conversation with some of you in the past years, I knew how much you all cherished her and most of all looked to her for guidance. The “Classy Lady” I remember shows through you all. I have fond memories of spending time with the family. I'm always glad to run into one of you or your children. I even had the honor of meeting her father a couple times. She raised a family of fine people. My condolences to all of you. We are deeply saddened on hearing that your Mom passed. Truly enjoyed chatting with her when delivering her Meals on Wheels, and remembering tidbits of "Bygone Days" from the Camden Blab. Maybe now her brother will let her drive the tractor. Our thoughts and prayers are with all of you during this difficult time. My Dear Suzanne, Allynn, Bobby, Julie, and Stephen, How lucky we have been to have shared this wonderful family together. We have spent more time in each others company than most relatives. My Aunt Dorothy, (my second Mother) was a very important inspiration in my life. She loved and cared for me through difficult times and wonderful times. Sooooo many memories of great times all through my life. I am comforted that she is in a happy place, free from pain, and with her mom and dad and sisters and brother. There might be some "scraps" going on up there but she loved the challenge, especially with her twin brother! Life has changed from what we knew it. There is a definite void in all our lives now, but she will always be with us, and never thought of with out LOVE! Oh where to begin, if I could pick a second Mom..it would have been Mrs. Capria, in fact for years she was, fixing all of our bumps and bruises and there were many of them with our large families. My fondest memories are from our time as neighbors on Clover Road, life was so full of fun and easy times there. My heart broke a little when the family moved to Route 31, after all..they were an extension of our family..But without fail we always stayed connected, every Christmas season running into Mrs. Capria and the family. I have tears wishing you eternal peace for you deserve it. With hugs and Love for you Mrs Capria, And Love for your family. From the whole Pierce family. I am so sorry for your loss. I have the most wonderful memories of your mom at University Pediatrics, I worked with her for most of her 20 years there, she was my mentor in many ways . She is fondly remembered and with love. I plan on attending the celebration of life on May 3rd. Please know that I am sending thoughts and hugs in your time of grief. Your mom was a very special person. Debbie Branning. I am so very sorry for your loss of your wonderful mother. No words can describe the feelings of such a tremendous loss. May God bless you and your mother as he takes her into his loving arms and know that she is at peace.